Low Maintenance & Upkeep Can Finally Be Yours! Although this is one of the biggest projects you will undertake for your home, siding installation will pay off in the end. Gone are the days of dealing with peeling, cracking, and fading paint color; with vinyl siding you’ll never have to pick up a paint brush again. This not only improves your homes’ appearance, and it also saves you money while increasing the value of your house. 1. Replacing the rotted surface wood on your house. 2. 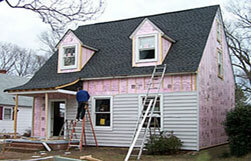 Using energy efficient insulation or insulation incorporated into the siding to cover the walls. 3. Under-capping the entire base of your house with PVC coated coil stock, so no part of your home is left unprotected. 4. 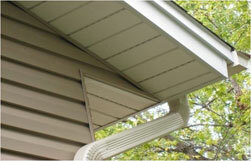 Installing reinforced vented soffit siding which eliminates the need to ever paint your eaves. 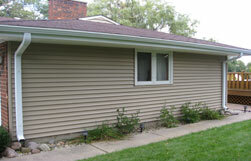 With vinyl siding you can create long-lasting curb appeal with minimum upkeep and maintenance. Just rinse with a hose to keep your exterior looking fresh and clean. There’s no longer the need to scrape and paint your home or replace rotting boards every few years. Vinyl siding’s versatility, low-maintenance durability, attractiveness and value have made it the most popular exterior cladding choice for homeowners. Once you’ve chosen vinyl siding, however, the most important decision is who installs it. Vinyl siding’s appearance and performance depend on proper installation and Total Contractors Services ensures that once you choose us for your vinyl siding needs, we will not let you down! Contact Total Contractors Services today at 866.956.0006 to learn more about our vinyl siding installation services for your home in Southeastern Michigan. Copyright © 2009 Total Contractors Services. All Rights Reserved.